If you have a dental emergency it’s best to see or contact a dentist. In case this is not an option, here are some tips for handling the 5 most common dental problems. It is best to get the crown re-cemented as soon as possible, but generally a crown can be out for a short period of time without causing any major problems. Try not to leave it out for more than a few days or it can make re-cementing very difficult. Keep the area clean. Gently brush and rinse with warm salt water. Is the tooth sensitive? Denture cream or toothpaste can be placed inside the crown and it can be gently fit back into place to help soothe the tooth. Rinse your mouth with luke warm salt water. Salt water helps to cleanse and soothe the affected area. *to make salt water rinse: mix 1 teaspoon table salt with 1 cup of warm water. If you can, take over-the-counter pain medications. OTC medications can be quite effective. Anti-inflammatory drugs such as Ibuprofen, Motrin, or Aleve generally work the best for dental pain. Use as directed. Use Orajel. 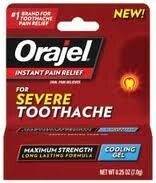 Topical anesthetic gels (such as Orajel) can help ease the pain, but usually for only a little while. Avoid anything that worsens your condition. Avoid overly hot, cold, or sweet foods. Even if the pain goes away, make arrangements to see a dentist. Without proper care your condition could worsen. Get some temporary filling material. Most pharmacies carry temporary filling materials that can be placed over sensitive areas until you see your dentist. Sugar-free chewing gum can also be used to cover the area as a last resort. *These products will keep out food particles and air from bothering the tooth until you see your dentist. A knocked out tooth can many times still be saved (re-implanted) if you act quickly and get to your dentist’s office. Time is your enemy in this situation. Quickly locate the tooth, or teeth. Very gently remove any obvious dirt or debris. Avoid touching the root as much as possible. Transport the tooth in milk or in some of the person’s own saliva. Make arrangements to see your dentist as soon as possible. If it’s after hours still call your dentist! Can’t get hold of a dentist? Your nearest Urgent Care or Emergency Room should be able to help. Ice the affected jaw joint or muscles. At the onset of the severe joint pain use an ice pack (20 minutes on – 20 minutes off) to reduce inflammation and help minimize pain. After 24 hours use moist heat. 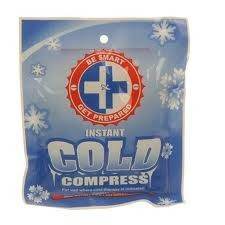 Use warm moist heat (like a warm washcloth) on the affected area after using the ice for the first 24 hours. The heat will help stimulate bloodflow and promote healing. Limit chewing. Eat soft, nutricious foods like smoothies, yogurt, mashed potatoes, etc. Limit the amount you chew as much as possible. Avoid gum, hard foods, and chewy foods. If you can, take over-the-counter anti-inflammatory drugs. Ibuprofen, Motrin, or Aleve work the best. Generally we recommend a consistent dose schedule taken for 1-2 weeks, but you should consult with your physician or dentist first before doing this. See your dentist. Have your condition evaluated!